KUALA LUMPUR, 10 May 2014 – Research in Medical Science at The National University of Malaysia (UKM) and other institutions should result in products and programmes that really matter. 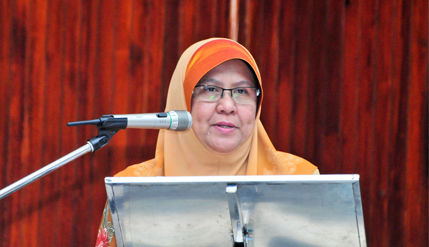 Deputy Vice Chancellor (Students and Alumni Affairs) Prof Datin Nor Aziah Mohd Awal said such research projects should eventually produce results that can contribute to the university and the country and they would be preferred for funding. Opening the 5th Malaysian Symposium on Biomedical Science at the Health Sciences Faculty here today, Prof Nor Aziah said UKM has taken various measures to ensure a research culture becomes an integral part of its academic pursuit to fulfil its role as a research university. Nonetheless research should focus on those that have a sense of purpose and having potential and promise. The two-day symposium organised by the Biomedical Science Club of UKM was attended by about 100 final-year students from nine local public and private universities. Prof Nor Aziah said there is an explosion of knowledge and capabilities emerging from many domains of research from around the globe. Thus researchers have to determine which ones can be used for the good of the people. Considerations for promotions are also given to academic staff who are actively involved in research as well as teaching, graduate supervision and publications, she said. The symposium which has become an annual gathering is aimed at encouraging productive dialogues between those involved in the biomedical science field as well as providing opportunities for networking and fruitful connections between the universities involved. Also present were Dean of the Health Sciences Faculty Prof Dr Zamratol-Mai Sarah Mukari, Chairman of the School of Diagnostic Applied Health Sciences UKM Prof Dato’ Dr Jamaludin Mohamed and Head of Biomedical Science Programme Assoc Prof Dr Siti Balkis Budin who chaired the event.